Download now! - Its free! 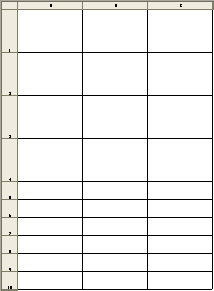 You can, if you want, enter your notes into the cells (if using the grid style worksheet) or the boxes (if using the mosaic style worksheet). Or you can do what we do: We just printout the worksheet and hand write our notes on it Then the next day, we create another quick notes sheet, update it with notes from the previous sheet, and print it out. Its fun to write down a task, get it done, and then mark through it! And, since it is on paper and hopefully on the center of your desk, its easy to see what you need to do. And you can doodle on it all you want! We use the large blocks for key tasks. We use the small blocks for daily routines. 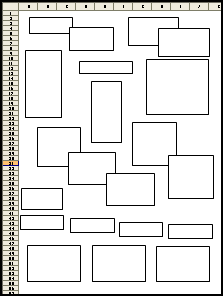 You can arrange the boxes on the mosaic sheet into any arrange you want. Or add more boxes to the mosaic sheet. The above quick notes sheets can be created in either portrait or landscape. You have full control on the number of tall (large) rows or narrow (small) rows that appear on a grid. And Quick Notes Assistant remembers your last setting. Another feature of the Quick Notes Assistant is that it can be set to remember your default quick notes workbook and open it with just a click! BEST OF ALL, IT'S FREE! Download now - click here!